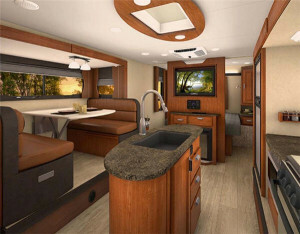 During the research process of buying a new RV for yourself, you’ll need to consider the “use-case scenario” for the camper you’re purchasing. Will you be using it on weekends? Will it just be a 2-day trip every month, or do you plan on living in it full time? 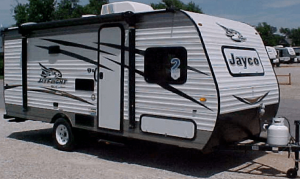 Depending on your answer,you’ll also need to consider whether or not you’ll be using the RV throughout all four seasons. 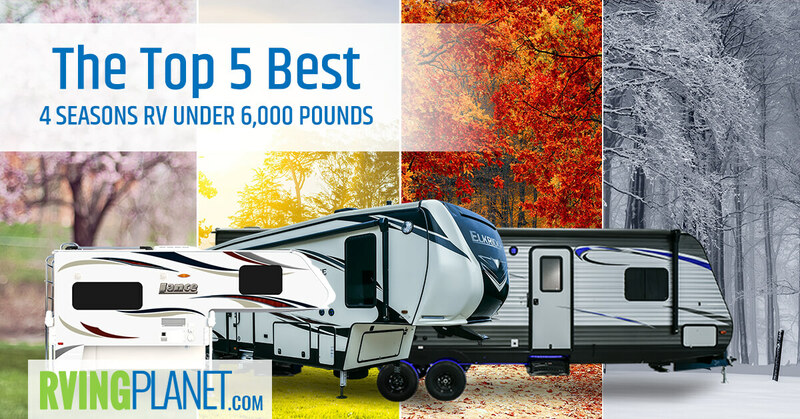 For those looking to use yours all year round and tow it without any hassle, here are our top 5 best 4 season travel trailers under 6,000 lbs GVWR. What puts an RV on the list: There isn’t a specific category of 4 season travel trailers per se. However, we factor in features specific to making your seasonal trips easier. This includes a camper with enough insulation, durability and expansions that make it suitable for use regardless of the weather outside. 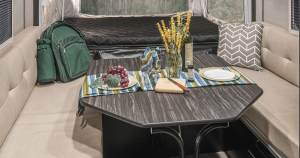 Why we recommend the Livin Lite Camplite travel trailer: The sole brand in Livin Lite’s travel trailer brands, the Camplite, has more than a few lightweight floorplans; some good examples being the Camplite CL14DB and the Camplite CL11FK. 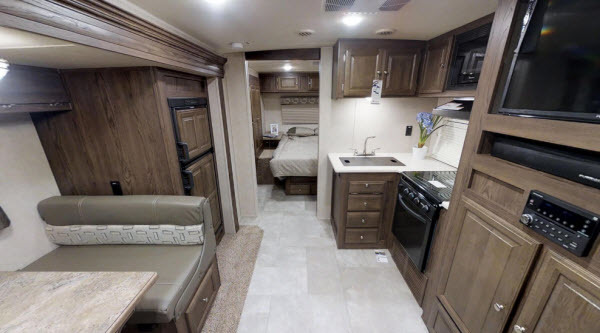 A few other floorplans sleep up to 6 people in addition to being durable and light enough to be considered as one of the 4 season travel trailers under 6,000 lbs GVWR! Dual pane windows on a travel trailer are a rare thing to see when you turn the filters down. However, the Camplite features a furnace–among many other insulation-based features–that make it usable for chilly winters! 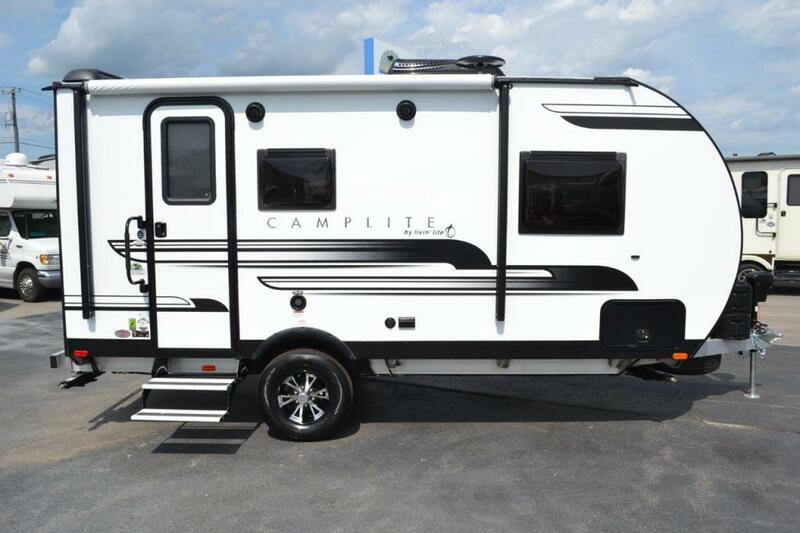 Combine that with its extremely durable construction and a whole bucketload of upgrades, and it’s clear that you’ve got a great piece of machinery if you go with the Camplite travel trailer. 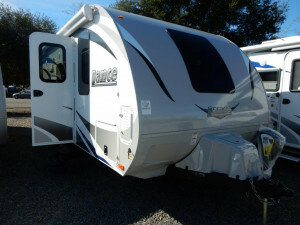 Why we recommend Lance Lance travel trailer: While our last week’s post featured Lance’s travel trailers as well, they also have a multitude of features that coincide with our list of “must-haves” for 4 seasons travel trailers. 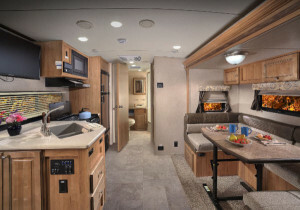 Some of their floorplans, such as the Lance and Lance, offer versatile options that create a unique and comforting, which is perfect for those of you planning on camping all year round. This is another one of those rare travel trailers that feature dual pane windows, Azedel interior walls for better insulation, and options that make this even better for all-year use. 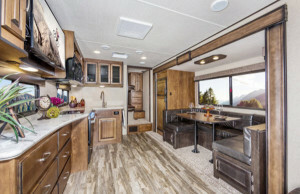 When it’s not cold outside, you can enjoy a great tailgating experience thanks to the exterior TV mounting, kitchen, propane connection and awning. 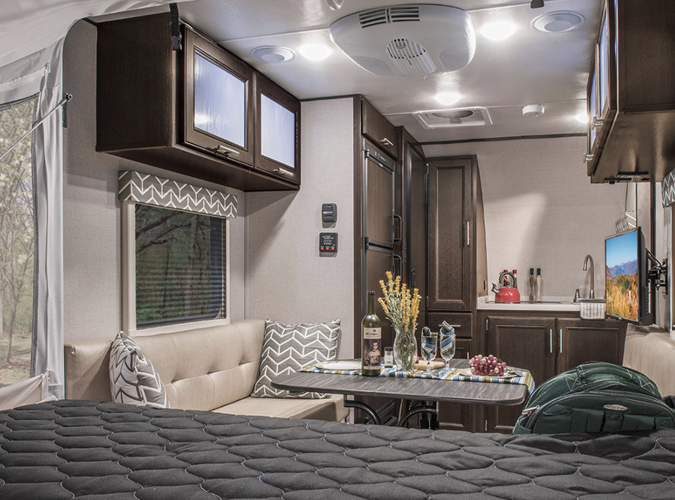 If you still wish for a numerous amount of better features, check out the Lance Lance Travel Trailer detail page to be greeted with a variety of customizable options! 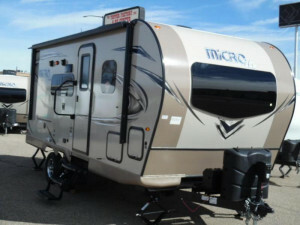 Why we recommend the Forest River Flagstaff Micro-Lite travel trailer: As the name suggests, the Forest River Flagstaff Micro-Lite travel trailers are both cozy and lightweight, with a few of its floorplans being well under 6,000 lbs GVWR and being great for use in any season, such as the Flagstaff-Micro Lite and the Flagstaff Micro-Lite. Luxury is really the name of the game when it comes to the Micro-Lite while still maintaining the title of a decent 4 season travel trailer. Optional thermopane windows, CSA certification, insulated sidewalls and a full aluminum frame are just a few examples of why you should go for it. If you need more, there’s a ton of upgrades available–from a ventilation fan all the way to oyster colored fiberglass sidewalls! Why we recommend the Jayco Jay Flight SLX travel trailer: Out of the 10+ brands of travel trailers from Jayco, the Jay Flight SLX travel trailers prove to be a good addition to our list of 4 seasons travel trailers. It provides a good mix of insulation, features, upgrades and floorplans, such as the Jay Flight SLX 145RB and the Jay Flight SLX 154BH. 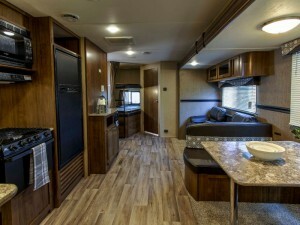 In addition to the others specifically mentioned, many of the floorplans hold 4 people. If you desire a larger travel trailer to boost the sleeping capacity, consider a model with bunkhouses (although they would be heavier). 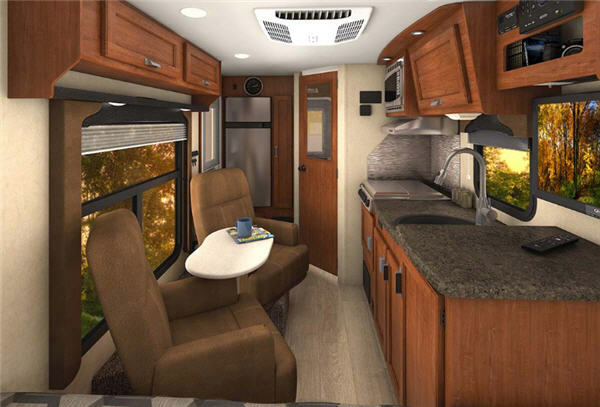 Looking specifically into the features you’ll notice that Jayco has paid quite a bit of attention to the insulation and construction quality. The insulated reflective coil coupled with optional upgrade to Canadian RV standards ensures that you’re warm during the colder months, which is pretty much the entire year in areas such as Minnesota and North Dakota. 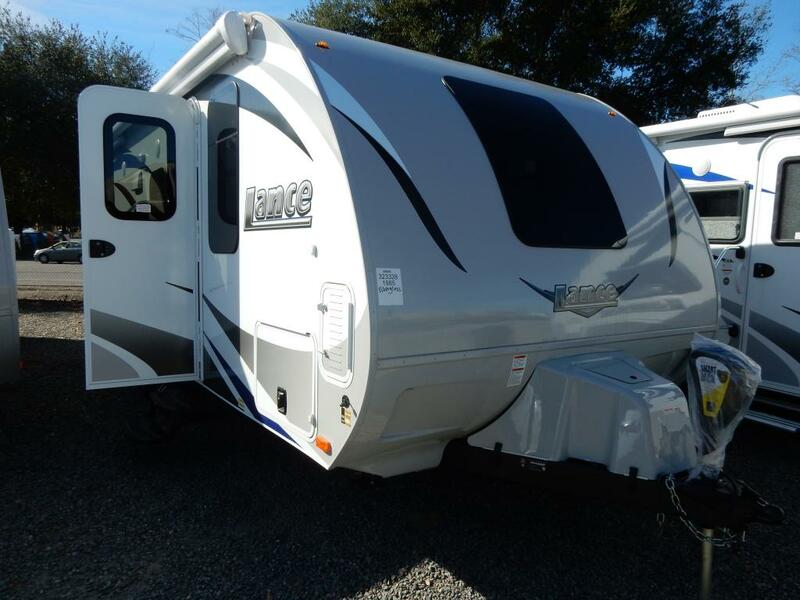 The aluminum construction, structural I-beams and fully integrated A-frame also ensures that it can tank those common bumps and turns when you tow your travel trailer. 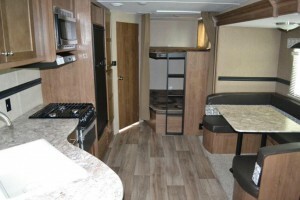 View All Dutchmen Aspen Trail Travel Trail Floorplans! Why we recommend Dutchmen Aspen Trail travel trailer: The Aspen Trail travel trailer by Dutchmen RV is our next choice for more than a few reasons. 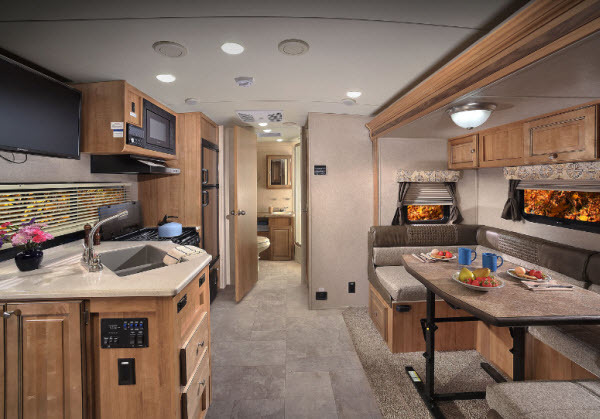 If the sheer number of floorplans weren’t enough, a lot of them are under 6,000 lbs GVWR. This includes the Aspen Trail 1600RB and the Aspen Trail 1700BH. These floorplans were designed with a plethora of scenarios in mind. For instance, the Aspen Trail has a sleeping capacity of 5 people despite being only 21 feet in length, making it great for people who are either tailgating or those who use their RV for a 1-day trip. 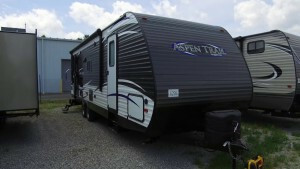 The Aspen Trail is as good as it gets for 4 season RVers. The heated underbelly, coupled with a high output furnace, is bound to keep the RV nicely heated. This is perfect for when you’re traveling through places with extremely cold weather. Luxury is also taken care of as it features an Aspen Trail command centre, evergreen mattress, bathroom skylight, and many other options to further enhance its 4 season capabilities! 4 Season RVing will be a breeze with our list in your hand. If you prefer a specific brand, we suggest keeping the construction, insulation and reviews in mind before looking at its bells and whistles! Share with us your favorite 4 seasons travel trailers under 6,000 lbs GVWR in the comments below!